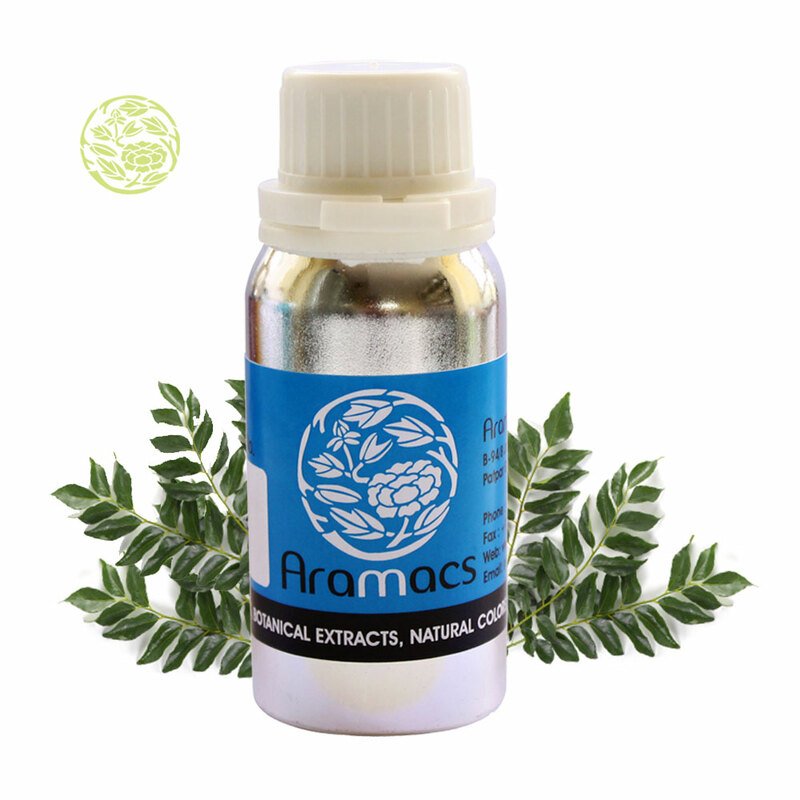 Uses: It controls iron deficiency and helps in skin nourishment.This oil is used in soap production. The plant is native to India and Sri Lanka. The plant grows in tropical regions and rich soils. It is also grown in Burma. The plant is best harvested during July and august. Nearly, 300 to 400 kilograms of leaves are harvested by the end of each year. The harvest starts ten to twelve months after plantation. The plant is named is believed to have been named after Lord Krishna and has an age oil history. The species name commemorates botanist Johann konig. Fresh leaves are steam distilled under high pressure to yield curry leaf oil. Under normal pressure, the yield is poor. The oil is pale yellow in color with a string aroma and a blend of sweet, bitter tone. The average yield obtained from fresh is 0.12% to 0.20%. The essential oil contains alpha and beta pinene and caryophyllene which are also present in allspice, clove and cinnamon. Tiny drop can be diluted with butter milk and taken every morning to ease gastrointestinal issues. The oil can also be diluted with lemon juice to aid in indigestion. External application of the oil wards off insect bites and stings. Curry + carrier oil can be applied around the eyes to treat dark circles and also prevents the development of cataract. 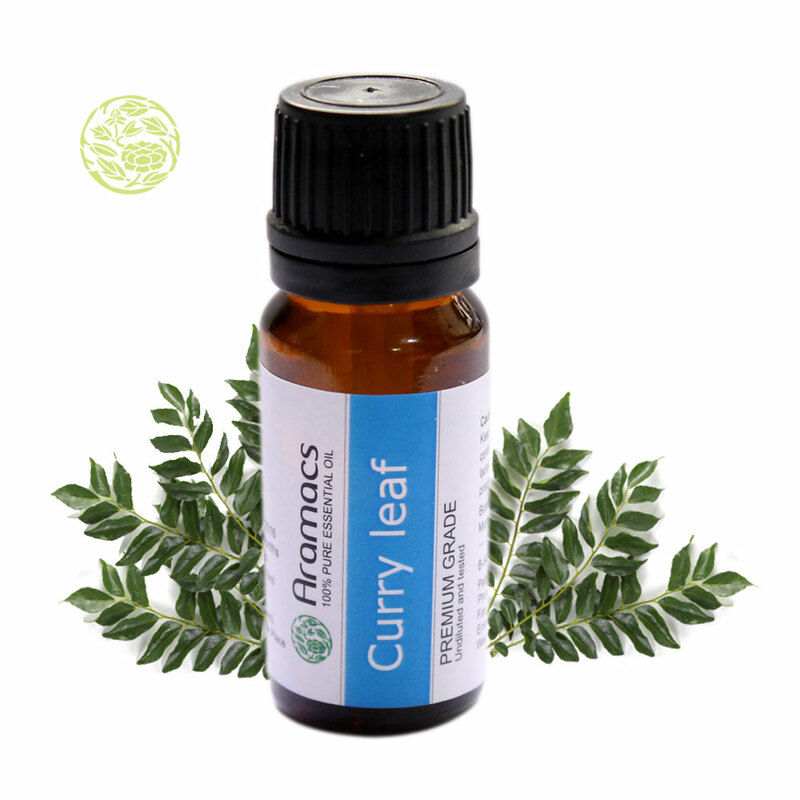 The essential oil of curry leaf is a good remedy for nausea. The oil is also good for hair growth and color. It prevents hair loss and premature greying and maintains the hair's natural color. The skin benefits of oil include medical dressing to treat cuts, burns, wounds, rashes, and bruises. The oil is rich in vitamins and minerals such as calcium, folic acid, zinc, and beta carotene that promote oral health. According to studies conducted by the department of Biochemistry in Kerala University, curry leaf oil has the potential to reduce bad cholesterol. The anti-hyperglycemic properties of the oil help in lowering blood glucose level. The oil is rich in anti-oxidants that reduce oxidative stress and removes free radicals. Curry leaf oil is also found to be effective against the effects of chemotherapy and radiotherapy offering protection to bone marrow and chromosomes. The oil consists of antimicrobial, anti-inflammatory, and hepato protective properties. The therapeutic properties include carminative, stimulant, analgesic, aphrodisiac, depurative, deodorant, fungicidal, revitalizing, and lipolytic. The Department of Medical Chemistry in Mejio University of Japan proved that the oil consists of compounds called carbazole alkaloids that fight cancer. The oil is used widely across South Asia as a flavoring agent. It is extensively used in curries and pickles. The Cambodians use the oil in making soups. The oil is highly prized in the West for its native flavor. The oil is used in the production of soaps. Curry Leaf is one of the most ancient herbs used in Indian traditions and culture. According to the ancient medical practices Ayurveda, Curry leaf is highly enriched with healthy nutrients. In addition, curry leaf is also known as a great taste maker and fragrance which can empower the taste of dishes. Almost in every Indian cuisine, curry leaf is treated as a necessary ingredient. Also, in every rural households and Indian villages, curry leaf tree is very commonly grown. I must say that the range of essential oils offered on your website is simply superb and I am also impressed by their delivery time. Will recommended it to all of you.